Try Miso & Maple-Marinated Cod with Sweet Pea Risotto from Feed Zone Table! This is a simplified version of the classic miso-marinated black cod made famous in the United States by Master Sushi Chef Nobu Matsuhisa. The cod works best when cooked under the broiler with the heat blasting down. You can also prepare it in a pan on the stovetop or on a grill. Cod is a delicate fish—in fact, as it cooks you will see the layers begin to separate a bit. For this reason, avoid flipping during the cooking time. Keep in mind the side you want to present, and make sure to cook that side up. This creamy risotto pairs beautifully with the fish. Republished with permission of VeloPress from Feed Zone Table. Please contact us to republish this recipe. TO MAKE THE RISOTTO: In a saucepan, bring the stock to a boil, then reduce heat and let simmer. This will speed up the cook time. Warm the olive oil or butter in a heavy pot over medium heat. Add the rice and garlic and gently toast, taking care not to let it smoke or burn. The rice will become translucent as it soaks up the oil or butter. As it begins to brown, add the white wine, stirring continually until the liquid has evaporated. Reduce heat to medium-low and add 2 cups of warm stock, stirring periodically until fully absorbed, about 10–15 minutes. Then add another 2 cups of stock and let the mixture cook down again, approximately another 10 minutes. The risotto will thicken as the stock is absorbed. Add the remaining stock and stir until you have a creamy risotto. The risotto will continue to absorb liquid as it sits, so use a bit more stock than you think you need. Add in the peas, Parmesan, and lemon zest. Season to taste with salt and pepper and additional olive oil or butter, if desired. Remove from heat and keep covered until ready to serve. TO COOK THE COD: Heat the broiler to high. Place the cod under the broiler for about 8–10 minutes, or until the marinade takes on a light char and the cod begins to flake. Let the fish rest for about a minute and serve with risotto while still warm. CHANGE IT UP You can also use 1 cup leftover salty meats like prosciutto to make a more savory risotto. Pair with a hearty vegetable such as asparagus or broccoli florets. Add blanched vegetables and meat in place of peas and lemon zest. 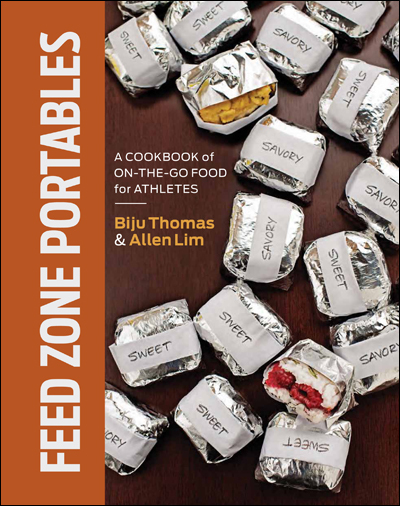 Feed Zone Table includes more than 100 all-new recipes to inspire family-style dinners in a way that nourishes life and sport.